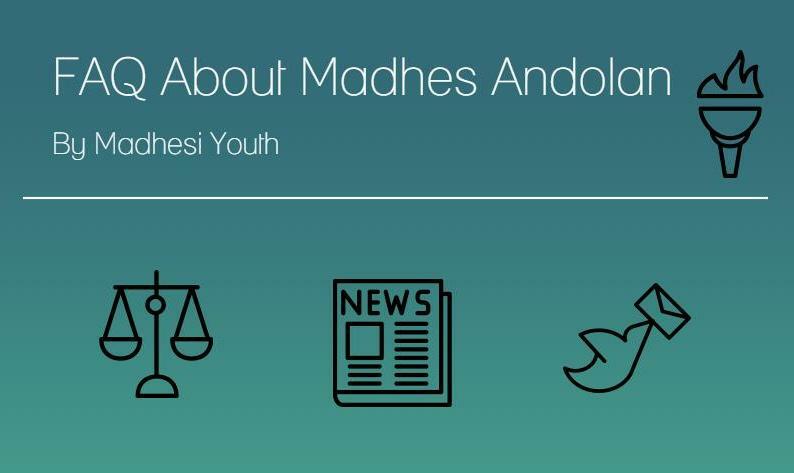 An attempt by members of Madhesi Youth to create a FAQ for Madhes Andolan. Why are Madhesi leaders agitating? A fair citizenship clause that will not prohibit children born of intercountry marriages (mostly with India) to be “Bansaj” citizen who can only bear office in Nepal (First Class Citizen). The new constitution violates some of articles in the Interim Constitution that were written after agreements between all parties. Read “Why Madhesi Resentment against the Constitution?” by Amit Ranjan. Also see below for more details. End the deployment of Nepal Army against its own citizens. Read “Representation of Madhesis in Nepal Police, APF, Nepal Army” by Puru Shah to understand further. End the brutal killing of innocent civilians, including women, children and elderlies. Use proportionate force to suppress the protests and show accountability for human rights violations. Read the report by international organization, Human Rights Watch: “Like We Are Not Nepali” – Protest and Police Crackdown in the Terai Region of Nepal. Acknowledge the deaths of Nepali citizens and policemen killed in Terai and provide compensation to their families. [This was recently met]. See the infographic “41 Deaths in 35 Days” by Deepak Shah. Declare martyrdom for those who were killed during political protests. What provisions in constitution are discriminatory and need revision? Ensuring provision of proportional representation in the new constitution as per the Interim Constitution. Constituencies should be based on proportional representation (PR). Only 100 out of 275 constituencies are based on PR. 165 are based on first-past-the-post electoral system. Constituencies should be divided on the basis of population instead of geography, population and provincial balance. The latter language is vague and can be misinterpreted. Recognizing local language as the official language at the local level. Citizenship issue where children from inter-country marriages are considered second class citizens. For a more in-depth understanding, read “Second-Class: The Nepal Embassy and Citizenship Inaccuracies” by Robert Penner. Incoming female non-nepali brides have to wait for 10 years, after they acquire citizenship, before they can work in a government office. For more, read “Being a Woman in Misogynistic Nepal” by Khushbu Mishra. Why are Madhesi leaders not happy about federal demarcation? Divides Madhesi cluster in Sunsari Morang and Jhapa. Reduces Madhesi representation.Leaves the current state number 2 as the least resourceful. It will have no major rivers or hydroelectric projects. A state without water will have no source of irrigation or energy, both of which are critical for development. Every other state is connected to indian border which makes it clear that government doesn’t intend to use Birgunj or Janakpur for trade which clearly doesn’t help state 2. Divides Madhesi cluster in the east and Tharu cluster in the west, thereby reduces marginalized representation. See “The Fate of Jhapa, Morang, Sunsari – Statistical Analysis” by Puru Shah to understand further. Why are Tharu leaders not happy about federal demarcation? Isolate Tharu province from hill as they know the deliberate gerrymandering will limit their representation. Similarly, Tharus fear that if hill districts are included, the capital may be situated in the hills and they would have to travel there for government paperwork. This shows a lack of trust between both communities. Why did Madhesi leaders reject the government’s call for dialogue in the past? Many experts argue that 48 hours is not adequate time to hold internal party talks, prepare, travel from Terai to Kathmandu, and engage in a meaningful dialogue. The parties in UMDF alliance allege that the call for dialogue appeared as a formality and lacked seriousness. Also, inviting the leaders while curfew is still imposed, Nepal Army is deployed, and people are being killed in Madhesh only makes the environment less suited for any kind of discussion that concerns the country and its citizens. While the decision to suspend any further progress was being made, 5 people in Janakpur lost their lives at Nepal police’s gunpoint and hence that kind of invitation is a token and essentially meaningless. See our article, “Dip Jha Explains Why The Environment for Dialogue Was Not Conducive” for more. Why do Madhesis claim that they are discriminated against while they hold two of the highest posts in the nation – that of the President and Vice President ? 1. Under the Interim Constitution, the President and the Vice President do not have any executive powers or any role in lawmaking.